This weekend, all eyes will be on China as the World Electronic Sports Games opens its doors. There’s plenty to watch, from top-tier Dota 2 to the League of Legends EU Challenger Series. We even have some top quality action from one of Hearthstone’s highest ranked players. All the details on this weekend’s events can be found below. 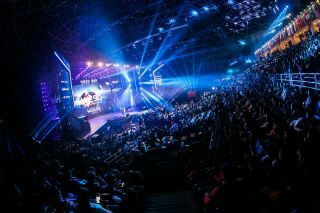 The World Electronic Sports Games event kicked off yesterday at the Changzhou Olympic Sports Center, China. The LAN finals event is the last part in the race for the whopping $1.5 million prize pool. A total of 24 teams have managed to secure their place in the final stage after nearly five months of gruelling regional qualifiers. However, it’s not all about the money as the tournament marks a historic moment in the Dota 2 competitive circuit. The WESG is currently the only event to offer over a million USD prize pool to teams formed exclusively from five players of the same nation. The full weekend schedule can be found here, while the event can watched over on Twitch. StarCraft II also has a fairly hefty prize pool up for grabs in China this week. The WESG will be giving out $402,000 in StarCraft prizes, which is considerably less than some of the others games, but it’s still a substantial sum. The quarterfinals start today at 22:00 PST / 07:00 CET, while the semifinals begin tomorrow at 19:00 PST / 04:00 CET. You can watch all the action over on Twitch. CS:GO also kicked off its group stage last night and will resume today. The quarterfinals start tomorrow, while the semi-finals and the grand final will be taking place on the same day, January 15th. There has already be an unexpected surprise as the Swedish CS:GO team GODSENT will no longer be attending the WESG grand final. GODSENT were set to compete against teams such as Signature, Team Kinguin, Space Soldiers, Bravado Gaming, and FIVE eSports Club before they bowed out. The full weekend schedule can be found here, while the event can watched over on Twitch. Counter Logic Gaming is set to be the favourite for this year’s title, as North American esports organisation welcomed Sebastian “Xixo” Bentert to their roster on Tuesday. His most difficult opponent will likely be fellow European player Liam “Lbdutchboy” Brouwer from the Netherlands. Xixo was the highest ranked Hearthstone player on the GosuGamers ladder last year, as he won the StarSeries Season 2 and defeated Jon “Orange” Westberg in the European WESG qualifiers. Make sure to check the WESG Facebook page to find the latest schedule times and streams. League of Legends fans can tune into the European Challenger Series qualifiers today as the 12 teams from France, Spain, Germany and the UK as well as Fnatic Academy, will battle out for the final two spots in the EU Challenger Series 2017 Spring Split. The finals will be best-of-five series, with the winner of each advancing to the EU CS Spring Split. Games will be played on patch 6.24 and the tournament will be played under the old six-ban rules rather than the new 10-ban ones. Play kicks off today at 08:00 PST / 17:00 CET, while the playoffs start at the same time on Sunday. The event can be watched over on LoL Esports.